Dimensions (HxWxD): 7" x 1.6" x 1.2"
This extremely rare Slim Long Water Clear 6 Gate 108 Sided Vogel Dream Wand from our special collection is extraordinary in every way. 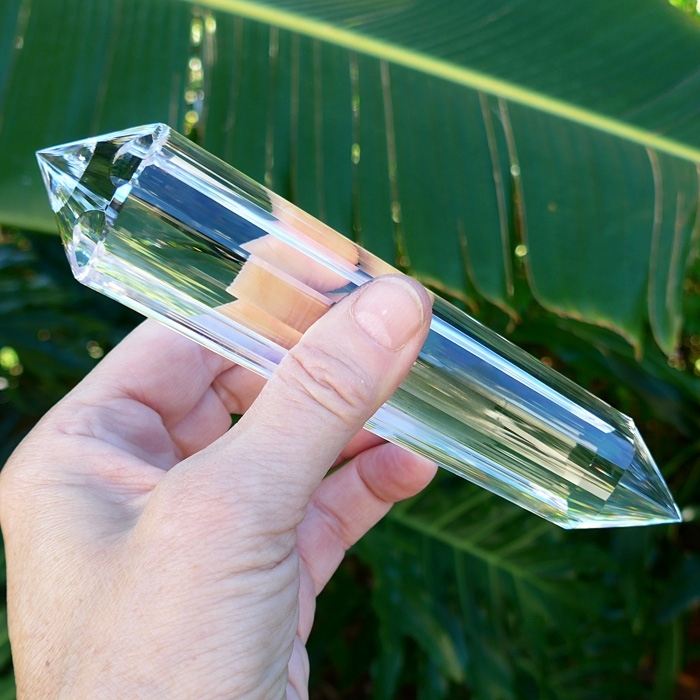 This amazing professional lightworker's tool measures 7 inches long and weighs 322 grams, approximately a pound, yet it is perfectly balanced, easy to hold in the hand during extended meditation or crystal healing sessions. 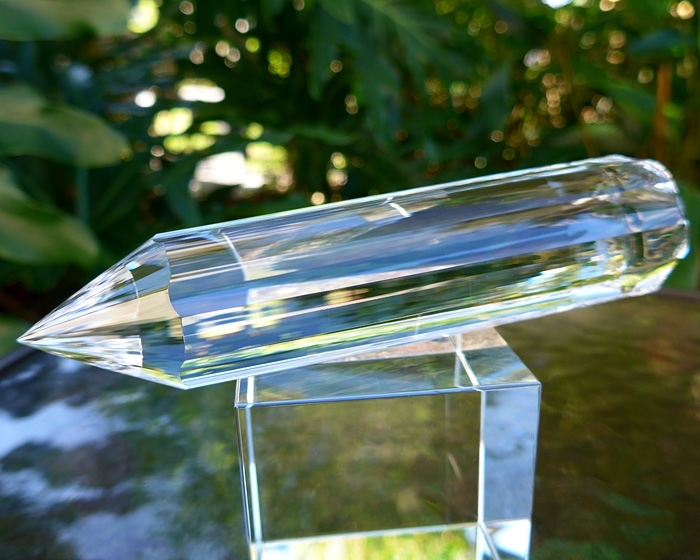 This amazing Vogel wand has 108 facets on the female termination tip, 108 facets on the male tip, and 6 concave facets on the shaft to optimize the flow of Universal Life Force Energy from Source into and through this remarkable tool for crystal healing. 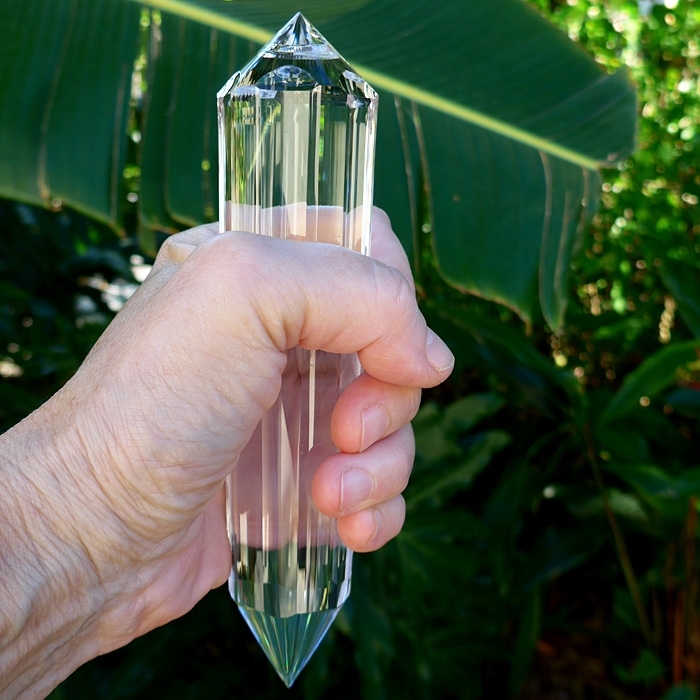 This 108 faceted 6 Gate Dream Vogel Wand is a product of the workshop of Master Crystal Cutter and Crystal Healer Ray Pinto, of Brazil, whose brother studied with Marcel Vogel. Ray is internationally known for the quality of his workmanship and the attention to detail and to the energetics of the crystals he cuts. 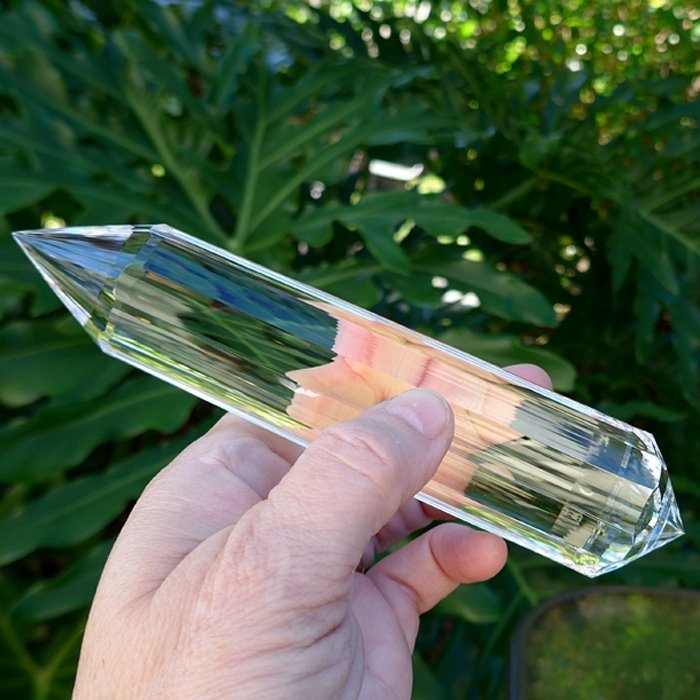 This 108 faceted Vogel Wand was cut in 2018, and obtained by Satya Center directly from the cutter, Ray Pinto at the 2018 Tucson Gem Show. This is a NEW style of Dream Vogel Wand that Ray has created in 2013, to improve the aesthetics and energetic power of these gorgeous healing tools. Ray extended the concave faceting on the shaft of this wand onto the female termination tip, a testimony to Ray's unparalleled craftsmanship. These extensions interact with the intricate faceting on the male and female tips, creating an amazing kaleidoscopic effect that catches the light and creates brilliant sparkles within the tips similar to what you see inside a diamond or other cut and faceted gemstone. These concavities on the female termination tip also serve an important energetic function -- enhancing the flow of Universal Life Force energy from the palm chakra of the individual using the wand, and thus increasing the flow of this healing energy through the wand. For healers working in the shamanic healing tradition of Alberto Villoldo, water clear Vogel wands are considered a requirement for extraction work, which removes negative energies and entities from individuals' auras and bodies. This Pentagonal Dream Vogel Wand would be the ultimate shamanic tool for practitioners from such a school. Look at the view of the female end, and the side shots of this amazing Dream Wand, and you'll see the concave facets of the new cut Dream Wands very clearly. You can also see the beautiful intricate scalloping where the shaft meets the termination faces. This is truly the work of a master craftsman, whose intent is informed with a most modern understanding of the ancient wisdom incorporated in forms of nature as manifested in the art and science of sacred geometry. From personal experience, we have found that this type of crystal to be immensely powerful, and we recommend this crystal especially for distance healing work and for energy work involving the transmission of energy to large geographcial areas or large groups of people. Likewise, this powerful Vogel wand is ideal for connecting to the Christ Consciousness Grid around planet Earth during group meditations and for communicating with Lightworkers in group meditations. Look at the head on view of the female end, and the side shots of this amazing Dream Wand, and you'll see the concave facets of the new cut Dream Wands very clearly. You can also see the beautiful intricate scalloping where the shaft meets the termination faces. This is truly the work of a master craftsman, whose intent is informed with a most modern understanding of the ancient wisdom incorporated in forms of nature as manifested in the art and science of sacred geometry. Vogel believed that the most important thing to remember in working with faceted crystals for healing is that the purpose of the faceting should be to amplify and transmit an increasingly coherent stream of energy to a subject. Marcel Vogel's healing wands were refined artistic versions of this well-known type of hexagonal natural healing wand, known for millennia to energy healers worldwide. According to Marcel Vogel's written specifications for Vogel healing wands, good Vogel wands should have precisely equal facets on the shaft and tips; good clarity, preferably 90% or more; a well-defined C-axis that runs parallel to the shaft; and termination tips centered in the very middle of the shaft. The male and female terminations should be sharp, and the male should be more acute than the female. The female termination should be larger than the male tip. 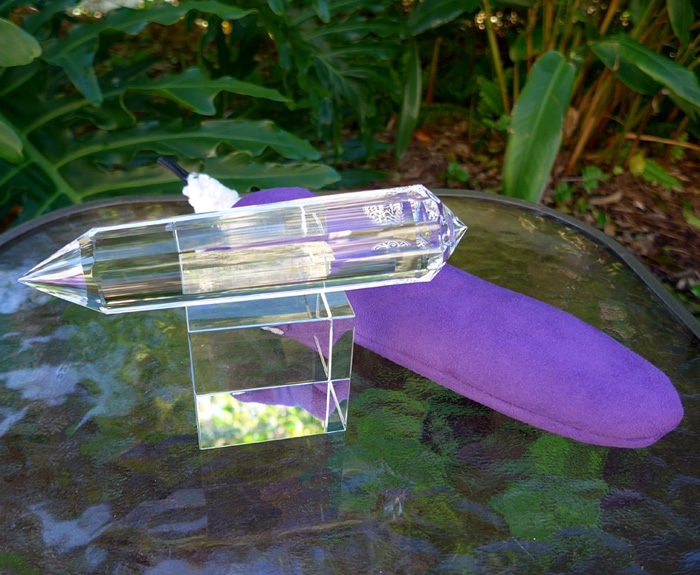 The male termination tip of this gorgeous Vogel healing wand is fashioned to form an extremely sharp tip designed to maximize the coherence and strength of energy streaming from the wand, while the female termination tip was cut a little wider, to maximize the area available for input of Universal Life Force energy from Source, and particularly from the palm chakra of the crystal healing practitioner. As the prana spirals down the shaft of the wand, the energy stream is amplifed every time it encounters a facet on the shaft. The super-charged energy stream coalesces at the male end of the wand, and is emitted as a highly coherent laser-like beam for use in meditation, vibrational healing and subtle communications. Energy and crystal healers prize Vogel cut quartz crystals to this day. The art of cutting crystals for use in healing requires extensive knowledge of the high art of crystal-cutting and polishing, an intuitive feel for the subtle energies involved, and an awareness of the needs of the energy healer who will be using the wand. In his early experiments with cutting healing crystals, which he conducted for many years, Marcel Vogel saw the Kabbalistic Tree of Life in a dream, which is shaped very much like four sided crystal wand with double termination tips. He created his first 4-sided healing wands in that shape, and told the story of their origin in the crystal healing workshops he gave students around the world. Over time, Marcel also designed 6, 8, 12 and 13 sided double terminated crystal healing wands and 6 sided single terminated meditation crystals with a flat base. At first he and his family cut them and sold them to students of crystal healing. Later they involved other cutters as well. 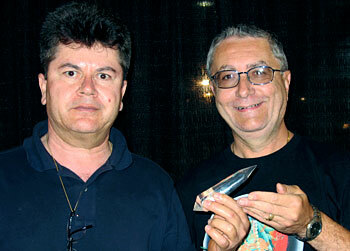 Ray Pinto's brother Walber Pinto studied directly with Marcel Vogel, who is now deceased, and Ray and Walber have practiced crystal healing and precision cutting of crystal healing wands for decades. Their artisanship and dedication to energy healing is well known wherever Lightworkers gather throughout the world. 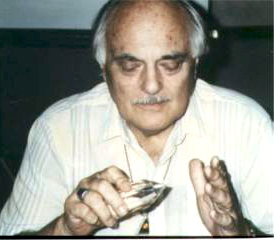 Since Marcel’s death in 1991, crystal designers and cutters like Ray Pinto and Drew Tousley, who was one of Marcel Vogel’s early cutters, have created healing crystal wands of new types with incredibly complex designs based upon principles of sacred geometry, which are still true to the basic ideas of Marcel Vogel. Today, we have 24-sided, 33-sided, 44-sided, 88-sided 108-sided and 144-sided Kabbalistic crystal healing wands, cut in the highly geometrical style originated by Marcel Vogel. In addition we have Dream Vogel wands, created by Ray Pinto after Marcel came to him in a dream in the early Nineteen Nineties. In 1997 Vogel appeared to Ray Pinto, who is the Brazilian cutter of this Vogel healing wands, in a dream. In the dream, Vogel showed Pinto the design for a unique healing wand with concave faces nestled among the traditional flat facets, on male and female ends. It took Ray nearly two years to refine the equipment he uses to cut the stones so that he could produce these exceptional precision healing tools. The Dream Wand connects the bearer to a Higher Octave of Energy, the energy configuration that exists in the realms above the seven physical chakras and the eighth chakra which is the locus of the Higher Self. Pinto says that the design is unique in its ability to connect us with our own Divinity so that we may more fully embody Unity Consciousness here on Earth. "The Dream crystal is composed of a combination of two facets," Pinto explains. "One is thin and flat and the other is concave and wide. The first thin and flat surface is termed a DOOR. The second concave and wide surface is called a GATE. 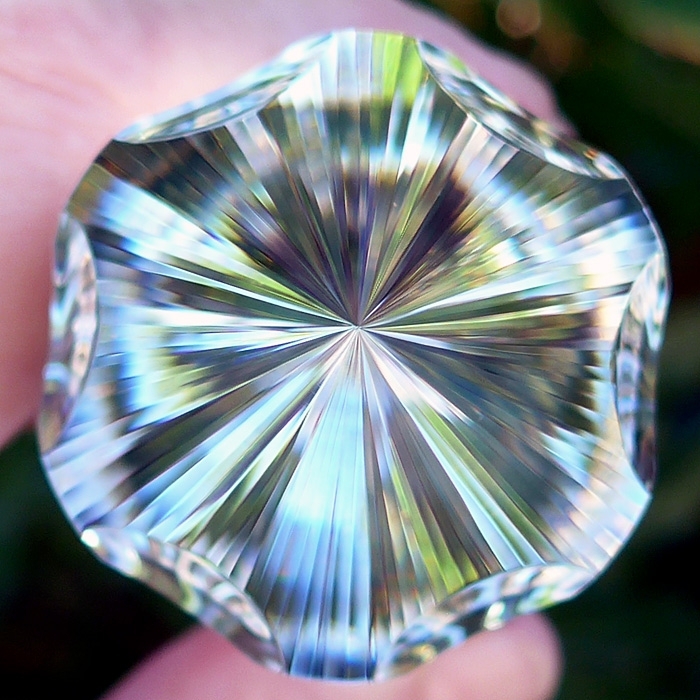 At the upper and lower terminations of the crystal there are thin and narrow facets known as WINDOWS, or combinations of the fine narrow facets with the large concave facets that reflect the body of the crystal." Pinto has designed the Dream wand to generate two kinds of energy fields. First, a concentrated laser energy field which flows through the focal points at the male and female termination tips of the wand. Second, a wide-angle plasma energy field that flows out through the concave faceted windows at the top and bottom of the wand's shaft. Thus this wand combines a highly focused laser-like flow of light energy from the male termination tip with a broader field of energy that†radiates outward from the concave faceted sides of the wand on the male end, during normal use. "The plasma field of energy is similar to that of a DNA molecule," says Pinto. "Since this plasma energy field has the same characteristics as the vibratory pattern of the DNA molecule, the Dream Crystal naturally resonates with the DNA of the cells, causing a release of genetic information that may be the cause of illnesses and certain abnormal behavior that inhibits our true freedom. Similarly, the laser energy field generated by the crystal acts in the psyche of the person, fully cleansing and organizing the matrix of the body/mind. In this regard, the Dream- Flower Healing Crystal is a powerful subliminal mind laser and a tremendously effective device for energy healing." Pinto says that the design is unique in its ability to connect us with our own Divinity so that we may more fully emody Unity Consciousness here on Earth. Now Ray Pinto has created yet another breakthrough design, a 21st Century update of the extremely powerful and popular Dream Flower Wand. This amazing wand has 108 facets on the male tip, 12 concave facets on the shaft, alternating with 12 flat facets on the shaft to optimize the flow of Universal Life Force Energy from Source into and through this remarkable tool for crystal healing. Look at the head on view of the female end, above, and the side shots of this amazing Dream Wand on this page, and you'll see the concave facets of the new cut Dream Wands very clearly. You can also see the beautiful intricate scalloping where the shaft meets the termination faces. This is truly the work of a master craftsman, whose intent is informed with a most modern understanding of the ancient wisdom incorporated in forms of nature as manifested in the art and science of sacred geometry. The 108 faceted Vogel style healing wand is the rarest, most precious healing wand yet produced according to Marcel Vogel's specifications. From discussions with very experienced crystal energy healers and from personal experience, it is clear that the "108" is an extremely powerful tool for distance Reiki, meditations involving distance healing of all kinds, and for meditations centered on connecting to the Christ consciousness grid surrounding the Earth, linking up with groups of Lightworkers, and for transmitting healing energy to large groups of people or geographical areas. Judaeo-Christian-Islamic monotheistic traditions hold that time is linear and that at the end of time, a Last Judgement of God will occur, marking the end of this Creation. However most cultures around the world conceive of time as being circular, or spiral in shape. In the West, the Greek classic philosophers agreed with the ancient Wisdom School teachings of the Eastern traditions. "Time itself is thought to be a circle," said Aristotle. "Those who say that the world exists forever do not mean the same world forever, but that one world follows after another at certain intervals of time, as Anaximenes said, and Heraclitus and Diogenes." The circular or spiral model of time leads naturally to a metaphysical system in which Creation emanates from the Source, undergoes a series of transformations, and then returns to Source, only to once again emanate as a new Creation after a period of quiescence. The concept of reincarnation of the soul naturally follows from this cyclical model of the Universe. Cosmic cycles are thought to be mirrored in Earthly seasonal cycles and in human life. The macrocosm is reflected in the microcosm and the microcosm reflects the macrocosm. As above, so below. In the ancient Sumerian and Babylonian calendars, and in Hindu and Buddhist astronomy, time is conceived of as a great wheel, modeled upon the yearly seasonal cycle, composed of four seasons of 90 days each, comprising a total of 360 days. This calculation led to a sexagesimal version of arithmetic, based upon the number six rather than the number 10, which is the basis for our current decimal system in the modern West. However, the Greek philosophers and Wisdom Teachers followed the ancient Eastern traditions when calculating astronomical events and Cosmic cycles. Censorinus says that the Great Cosmic Year of Heraclitus consisted of 10,800 solar years. One human generation is thought to be 30 years, and when 30 is multiplied by 360, the number of days in the calendar, the result is 10,800. In "Jyotish", the Hindu system of astronomy and astrology, there are said to be 10,800,000 stars in the Universe, according to the "Satapatha Brahmana". There are 12 zodiacal houses in astrology, and 9 planets, and 9 x 12 = 108. The Ancient Wisdom Teachers of East and West often removed the final zeros from any number to obtain its numerological significance, and when one removes the final zeros from 10,800, the number of years in the Great Cosmic Year of Heraclitus, and from 10,800,000, the number of stars Jyotish seers found in the sky, we obtain the sacred number of completion, 108, which represents the totality of the Universal space-time continuum in its present cycle of Creation. In both Eastern and Western schools of numerology, the number 1 refers to Unity, and thus to the Divine. The number 0 refers to space, emptiness, or completeness. The number 8 refers to infinity, and also to the cycles of time, and the number eight is often pictured in the Mystery School traditions as a snake swallowing its own tail and represents the end of a cycle, the integration of past changes and the initiation of a new cycle. Thus the number 108 refers to the Unity of Space and Time, the space-time continuum. According to yogic science and Ayurvedic medicine, there are 108 energy lines converging on the heart chakra, and thus the sacred number 108 refers also to the heart chakra itself, which is another example of how the microcosm and the macrocosm mirror one another. As above, so below. 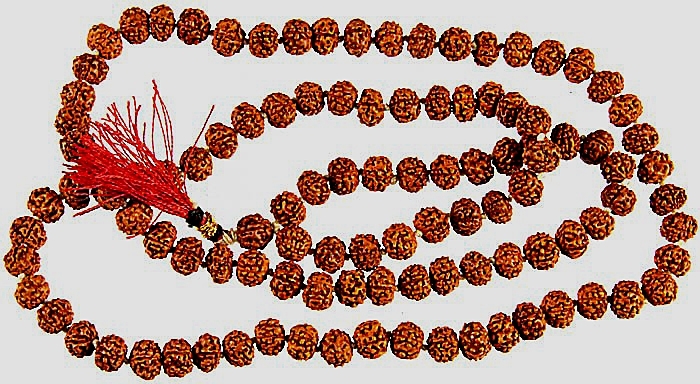 Both Buddhist and Hindu devotees use prayer beads, called malas, to count the number of repetitions of sacred prayers or "mantras" recited during their spiritual practices. These malas contain 108 beads. When devotees complete a complete cycle of mantra repetitions on their mala beads, they have completed a "full circle" of offerings to the Divine. The 108 faceted Vogel wand partakes of this Ancient essence of completion, and of heart-centered Unity consciousness. The "108" offers the practitioner a feeling of holding liquid light in the hand, and of being able to direct this fluidic energy very precisely. In meditation, I use a "108" sometimes to enhance and elevate my own energy signature. Simply by holding the wand vertically in my left, receiving hand, while seated in a half-lotus position, I can attune my intent to receive energy and communications from my Higher Self, spiritual guides and teachers, and other sources in the spiritual realms, and the "108" will amplify and direct those energies to my mind and through my lightbody and physical body very powerfully. Shifting the wand to my right hand, I can easily direct energy upward to the Christ consciousness grid, or throughout the area around me, indeed throughout the entire globe. In my experience, when used in energy treatments with individual clients, the "108" directs a measured amount of liquid light to the recipient, calibrated precisely to the individual's needs and capacity to receive the healing energy. This wand comes with its own FREE handmade pouch constructed of 100% polyester fleece and micro bonded suede that has the look and feel of real sheepskin. They are designed for a snug fit and come with extra padding to protect delicate tips and points. At this time our pouch maker is creating a pouch for this new wand. The picture below is of a representative pouch with a similar wand. When you purchase this wand, we can send it to you immediately wrapped in felt, and when the pouch is ready we will send it to you at our expense. This crystal can be used for meditation, clearing, for hooks and cords work, for shamanic journeying or any other vibrational healing technique. As with all of our crystals and jewelry at Satya Center, these are first cleaned and cleared with Reiki energy, color and prayer, and then given a Reiki attunement. "Know, O man, that Light is thine heritage. waiting to rend the veil of the night." Note: weight above is shipping weight. Net weight is 11.35 oz., 322 gr., or .7 lb.